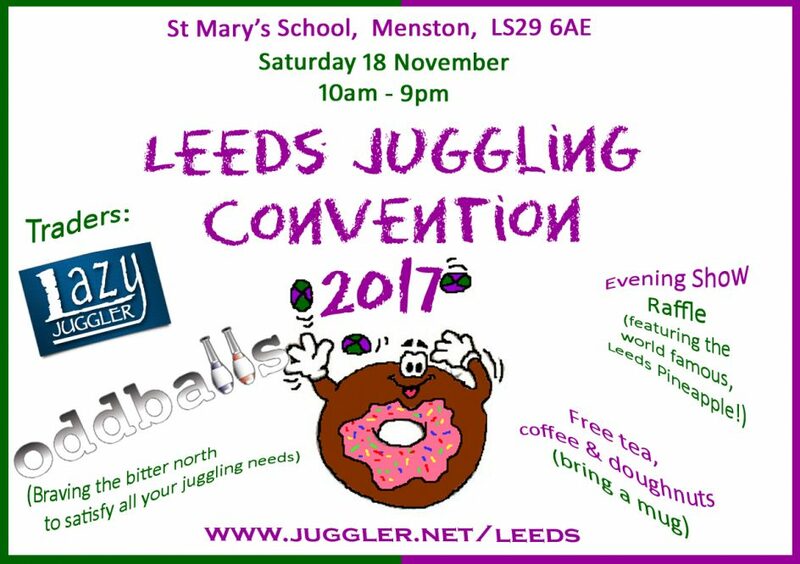 I was quite involved in the organisation of the Leeds Juggling Convention 2017 so here follows my brief recount of the day rather than an actual full review of the convention. 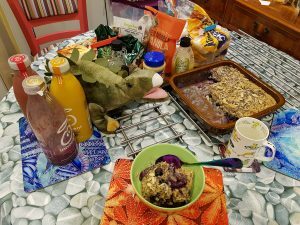 Breakfast consisted of a slice of my special blueberry and spelt bake gently warmed in the microwave, served with a selection of fruit smoothies. Mark and I had breakfast and left early to reach the convention site for 9am, leaving all the sleeping beauties behind. On arrival we started to make our way into the hall just as the Oddballs van rolled up so we directed them down to the fire doors near the main hall. When we got in the hall we found the heaters already on and merrily blasting away. 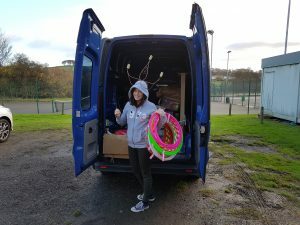 We got stuck into helping Oddballs unload the van and managed to acquire 8 tables to house all of their gear. At 11:00 I ran a beginners’ Lasso workshop and exactly the right number of people came as I didn’t have any more spare ropes for people to borrow. I took everyone through the anatomy of the rope and got everyone to begin with the flat loop before later moving onto the wedding ring. Lasso is an annoying prop as it requires everything to be ‘just right’ in order to work but I think everyone managed to get a flat loop and some also managed a wedding ring so that was successful. A general shot of the hall. At 12:00 I went along to Nik’s ‘Moonwalking and Gliding Techniques’ workshop with Jenni and Matthew. 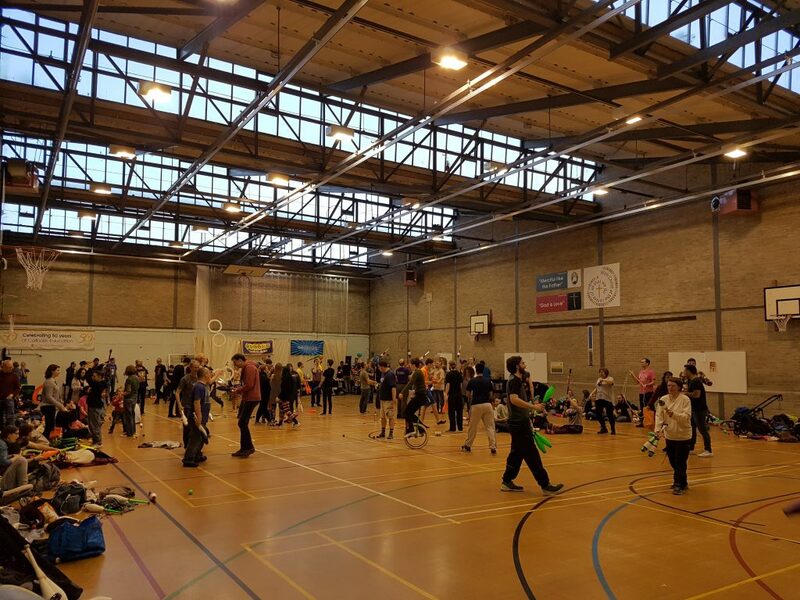 I went to Nik’s workshop in 2012/13 at Oxford Juggling Convention and really enjoyed it then (despite still recovering from an injured ankle from that BJC). I was pleased that I remembered some of the techniques and by the end of the session could pull off a bit of a shaky moonwalk. Directly after the workshop we gathered a gang together and headed out to the Wetherby Whaler for lunch. 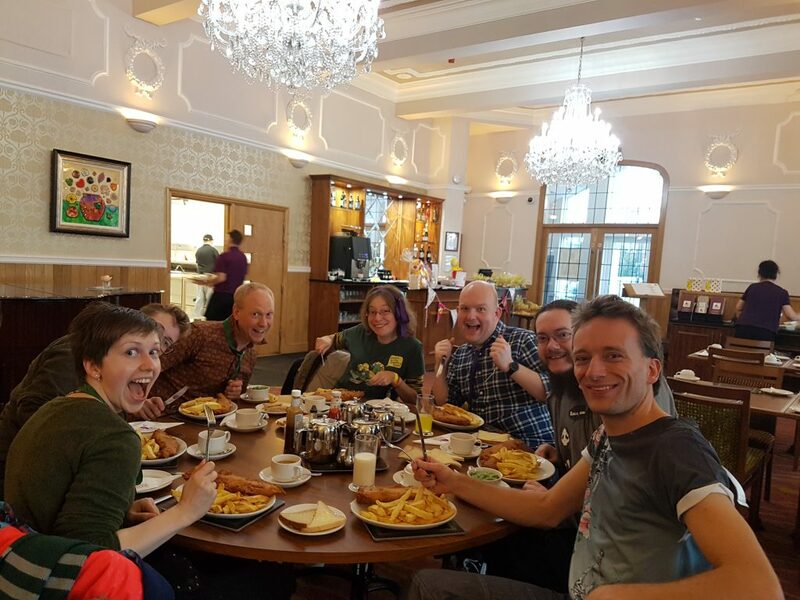 We were immediately identified by the staff as being members of the convention and were offered our 10% discount, excellent. 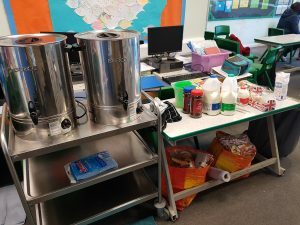 We enjoyed a lovely lunch of fish and chips, bread and butter and tea and a glass of milk. Jenni got confused with the seating arrangement after going to the loo and coming back to find everyone had moved round the table one space. 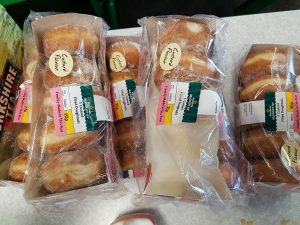 After our food we headed back to the hall, via a cash point, and we visited Lazy Juggler and finally spent our wedding voucher on Dominion and Mauna Kea. 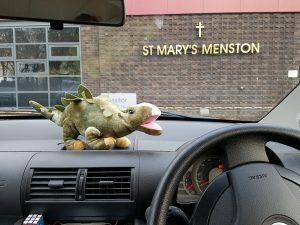 I also went to Oddballs and picked up a few things I had ordered in. Then it was time to head to the show hall and start getting set up. I built the stage while Ash set up the sound and tried to get rid of an annoying hum with the sound system. It wasn’t long before our team of helpers came and helped finish the stage, set the chairs and Alastair set the back drop. The acts started their teching and we spent some time adjusting the lights of that ever careful balance of being visible but not blinded. I think we did well. The rehearsal of the final bows finished bang on 6:30pm and we were able to throw open the doors and invite everyone in to see the show. 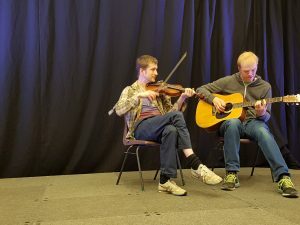 Tiff and Paul played music to entertain everyone while they chatted and bought more raffle tickets. I was running the lighting desk for the show and so didn’t give the acts my full attention which was a shame. Apologies to the acts for the very brief review / synopsis of the routines but I was working. 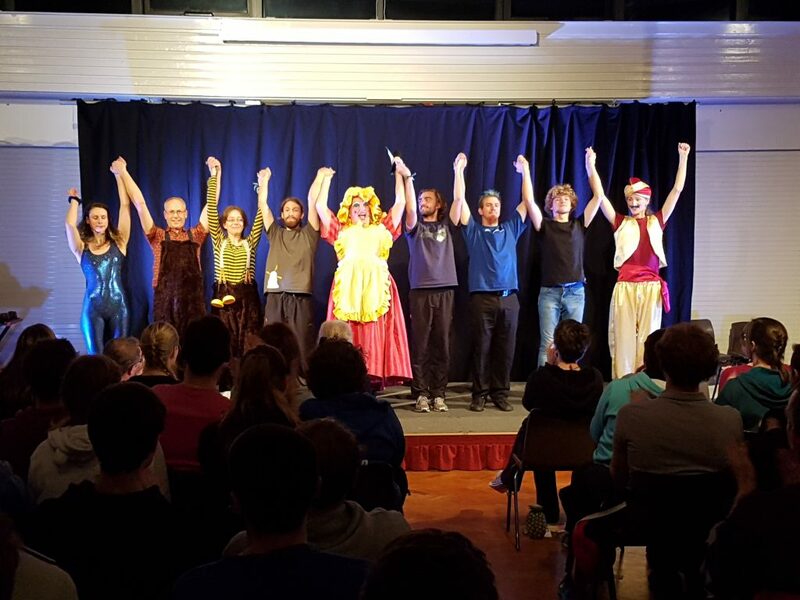 The show was Panto themed and I think it got a mixed reception. 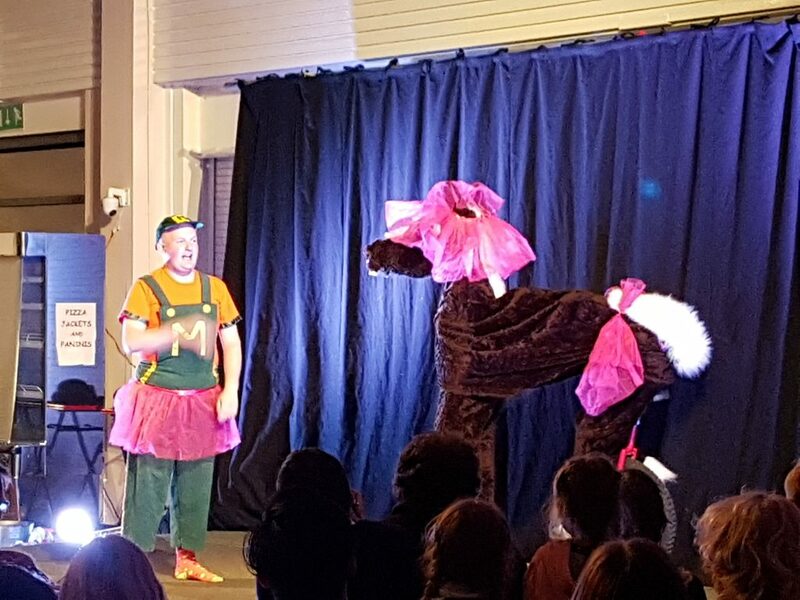 Muddles was our compere for the first half of the show and regaled the audience with lots of Panto gags between introducing the acts onto the stage. 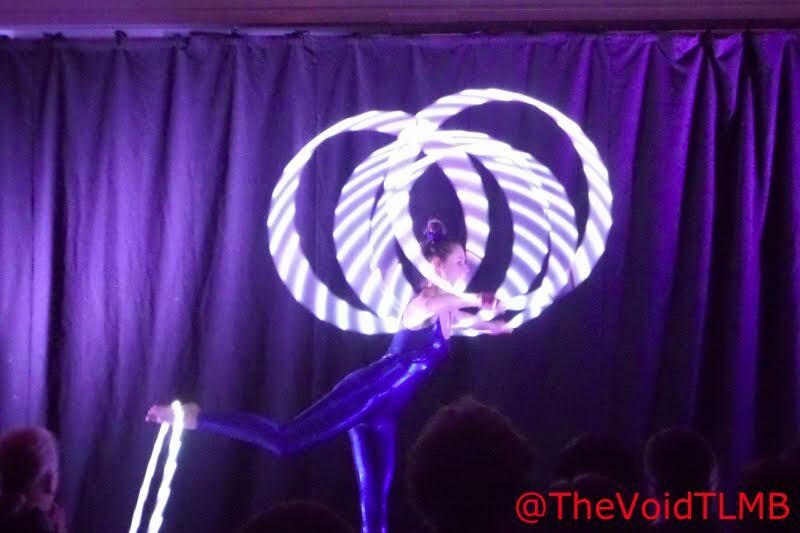 Jenny Collins opened the show with her hula hoop routine which turned to a glow routine halfway through. Lots of cool multi hoop tricks. 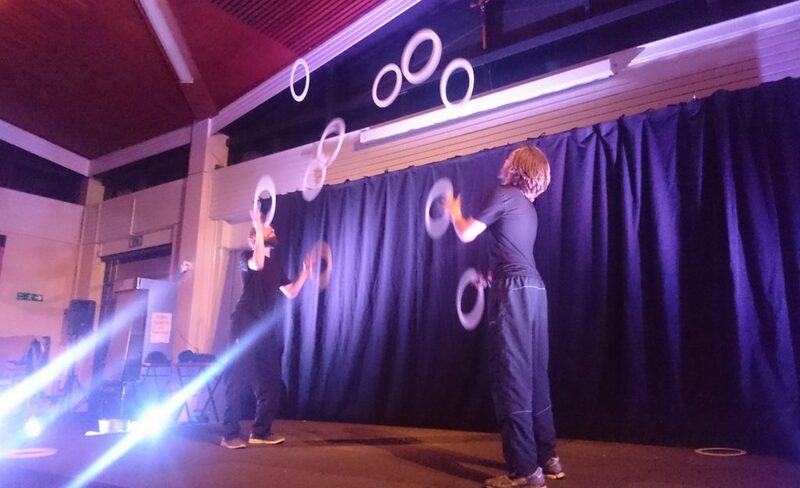 Cameron and Mark performed their ring passing routine, my mum particularly enjoyed this routine. Mark and Cameron performing their ring passing routine. Photo Credit: Bryn Hoyle. 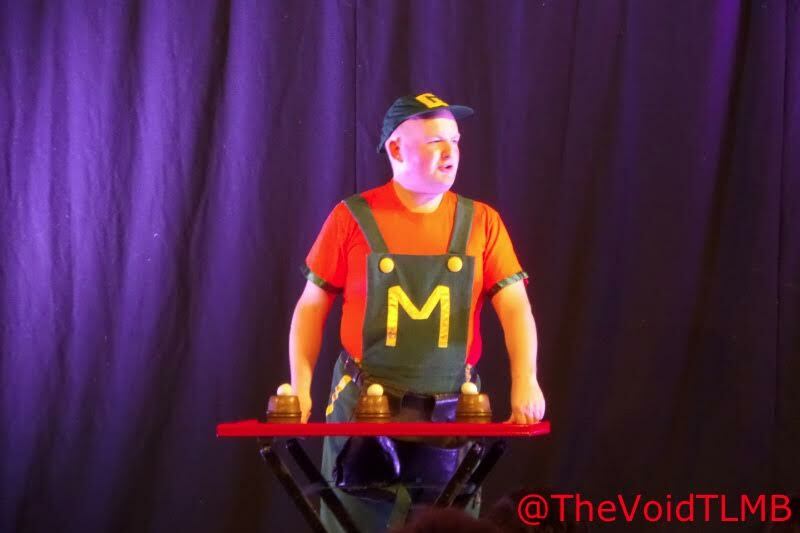 Closing the first half was Muddles who performed the classic cups and balls magic routine. His patter wasn’t very original, I feel he stole quite a lot of material from the magical Mark Watson who is an excellent magician and showman. At the end of the routine a pineapple was produced from thin air and was announced to be the star prize of the raffle! An interval occurred where I chatted to Muma and Mike before returning to my desk for the raffle. There were a multitude of excellent raffle prizes on offer, my Mum won the pineapple. 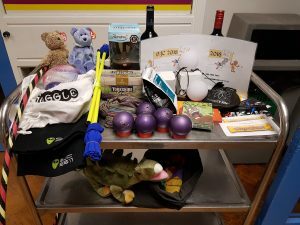 An excellent selection of Raffle prizes! 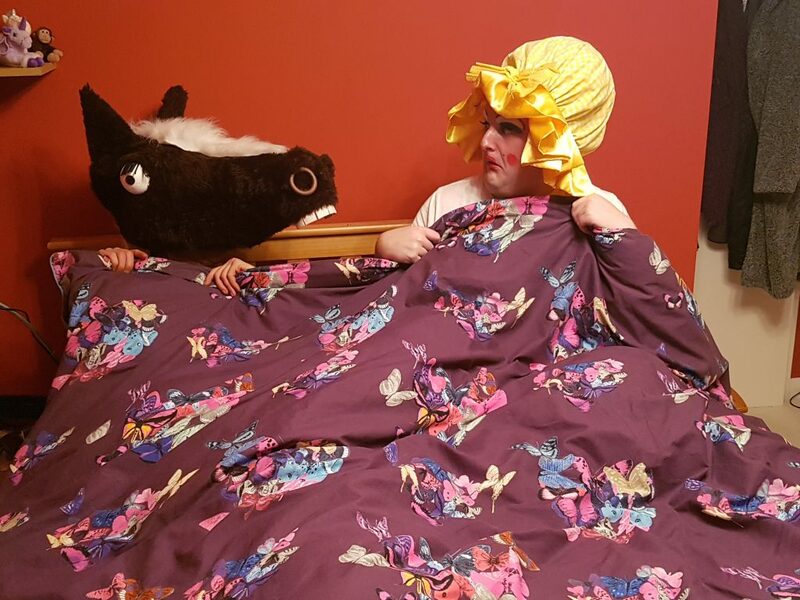 Muddles got in trouble with his Mum during the interval and so Dame Sarah the Cook took over the second half of the show and frightened the children. There were some excellent gags and some very frightening makeup! Rob opened the second half with his cigar box routine. I really enjoyed it a lot but he needed a drop mechanism. It wasn’t actually a droppy routine at all but it felt like it was as your attention was drawn to the drops by Rob’s reaction to them. Felix performed his excellent and very technical ball juggling routine finishing with a lovely run of 7 balls to finish right on cue with the music. Closing the show was Nik Robot-King who appeared as a magical genie with excellent make up and costume. Lovely contact ball manipulation with wonderful expressions. I realised as soon as the routine began that only the first couple of rows could see his feet! Such a shame, there was a lot going on down there as well. The final bows were well executed. 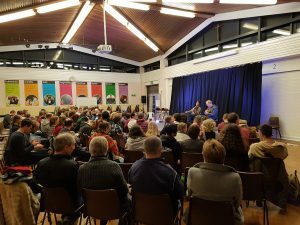 The panto themed show has been talked about and been on the cards for a long time now, well done to Rosie and Mark for bringing it together. 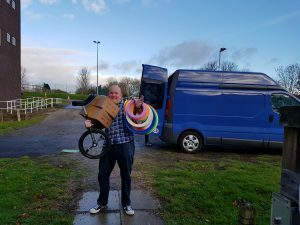 While the audience milled around saying their goodbyes I helped break down the stage and clear away a lot of the equipment and packed away the chairs. Once we got the hall cleared I collected Mark and Lizzy and we all loaded the cars before hitting the road back to Peat North HQ. The evening got a bit weird towards the end. I spent most of the convention working or doing stuff behind the scenes so didn’t get to enjoy the atmosphere in the hall for long. I think everyone had a good day but I would love to hear if anyone has any positive or negative feedback which we can use to make next year even better! We have already decided to allocate someone to be the workshop announcer in the hall as this was a bit lacking. We are also going to get some more signs printed up, namely for the workshop boards. 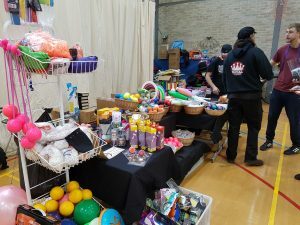 Massive thank you goes to the Hullabaloo team who worked their socks off to make the convention happen on the day, all the workshop leaders and show performers and everyone who came along and made the day such a success.